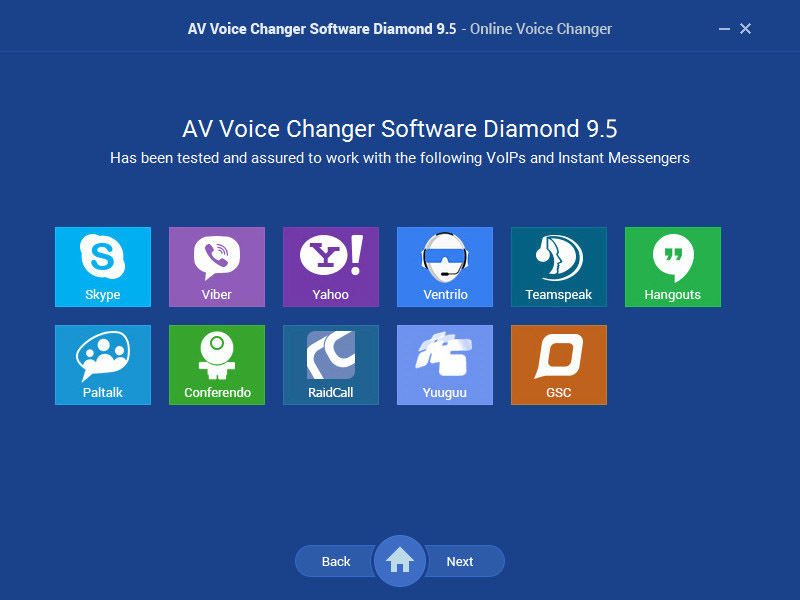 If a normal call voice changer brings you the feeling of professionalism, Voice Changer Software Diamond 9.5 can also bring you the trendy and friendly feelings while using its morphing settings and specialized functions as well. Let's see why it deserves to be called the best Call Voice Changer! A simple flat skin interface supports touch-screen technology, bringing the trendy and professional feelings. Formed by various curved lines representing the flexibility and accuracy in morphing, every arching set point offers a completely different voice tone for user. 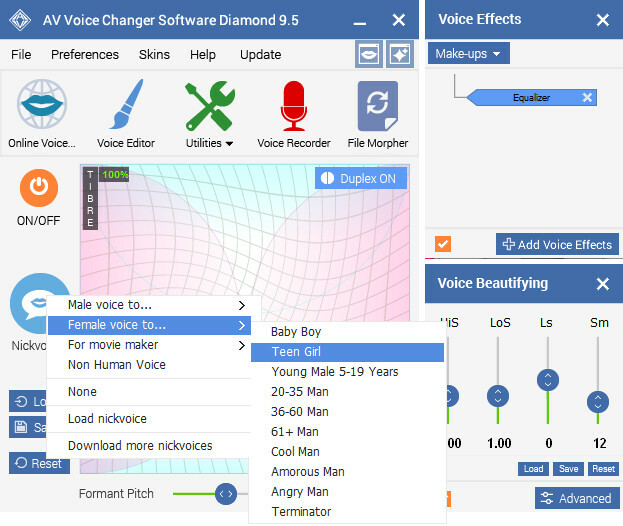 The "Nickvoice" menu of this advanced voice changer has been broaden up. They are put in various categories such as sample output voices for man, woman, non-human voices and a specialized movie maker "Nickvoice" menu for your extreme entertainment. 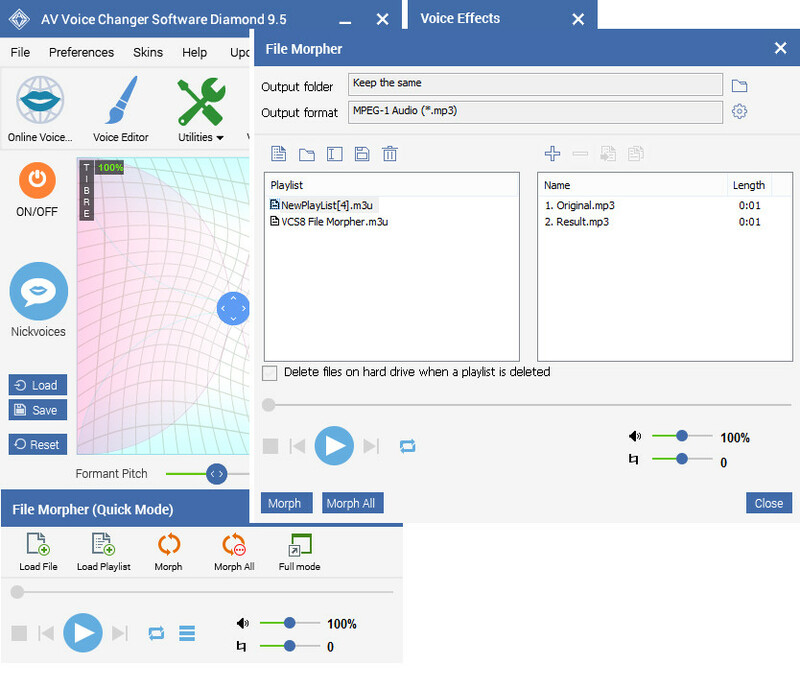 With the presence of this abundant menu, you now can achieve the desired output voice in just-one-click (click and talk!). 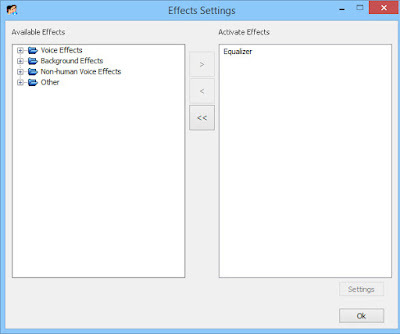 The most powerful and effective Voice Effects and Voice Beautifying settings specializing in modifying voice/sound are now designed at the main panel to make output voice more natural and morphing processes more precise and faster. Voice Changer Software Diamond 9.5 provides user a long list of unique voice effects as well as vivid non-human voices. You now can use these available effects to make funny calls with your friends show people your hidden talents via internet call. It also offers the cool background effects to make your output voice more natural and professional than ever before. 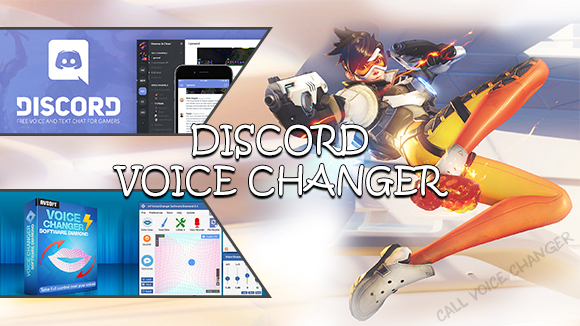 This program proves to be the best call voice changer by including special tutorials for many voip programs such as using voice changer for Discord, Skype, TeamSpeak, Ventrilo and many other voice changing tasks. These colorful navigation buttons can be easily recognized and used on the main panel. 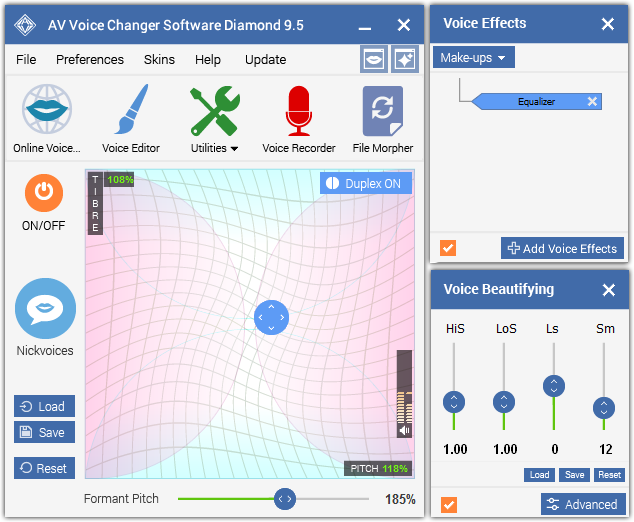 Voice Recorder has been improved for clearer and better quality. Record as many times as you like, in normal voice or morphed voice and even then each session. 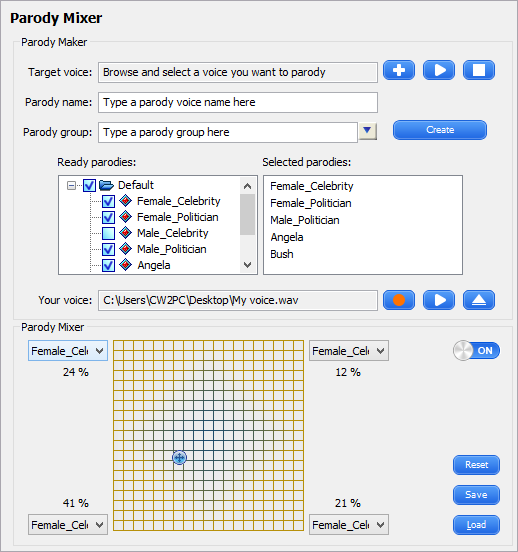 More precise Parody Maker helps you create interesting, creative parody voices and mimic other people's voices. 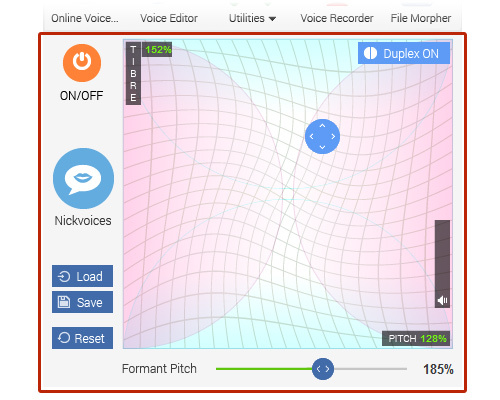 Your voice and the target voice will be compared and suggested the best morphing settings to modulate and make your voice sound most similar to it. 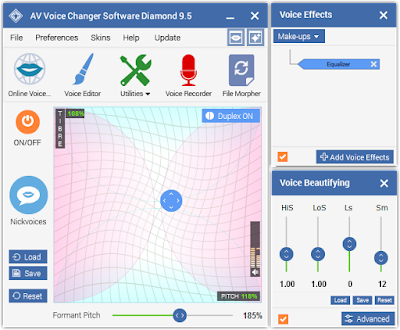 Voice Comparator feature has been upgraded for best similarity between two voices. Sound Analyzer feature from Voice Changer Software Diamond 9.5 analyzes your voice characteristics in real-time and visualizes them in graph form. 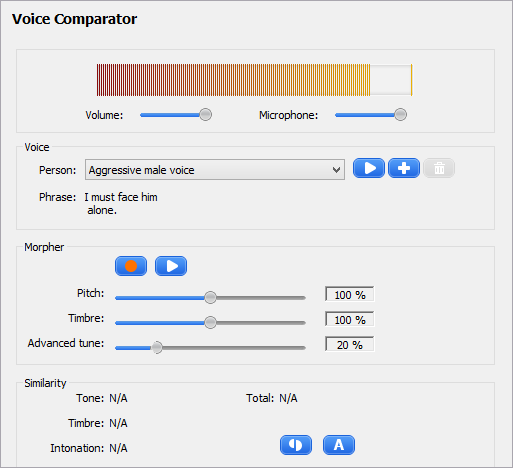 Voice characteristics are analyzed such as harmony, brightness, pitch and score. 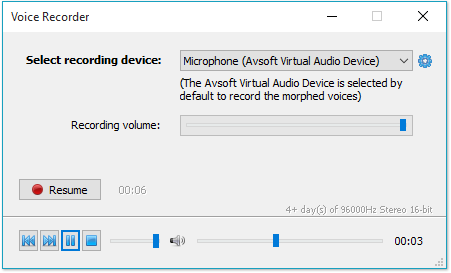 File Morpher to convert and morph batches of audio files. It is available in two modes: Quick Mode and Full Mode.